When Sarah Low casually mentioned a visiting "Russian Fleet" in a letter home (19 December 1863, Washington DC to NH), it sent me down a deep dark research rabbit hole... And now, after this week's spate of non-stop US-Russia "Summit" news, it all seems an eerily timely lesson from the past. What were Russian imperial warships doing in US harbors along BOTH coasts during the US Civil War? In 1863, Russia faced a rebellion in occupied Polish territory. 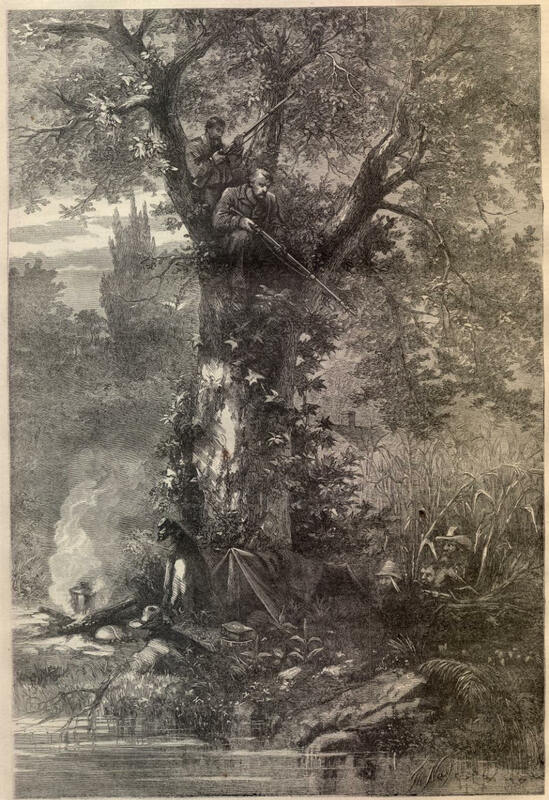 Britain supported the Polish rebellion -- and at the same time was considering supporting the Southern rebellion in the US Civil War. Russia needed a safe place for her Atlantic squadron, out of the reach of British & French navies -- so the ships went to New York. Russia's Pacific squadron also took up position in San Francisco bay as a neutral guard against Confederate raids. The US government used the visiting squadrons to scare Britain & France away from supporting the South (and to depress the South as well). I'm not sure what to make of THIS breathless account over at "Russia Beyond," except to say the pictures are pretty cool. 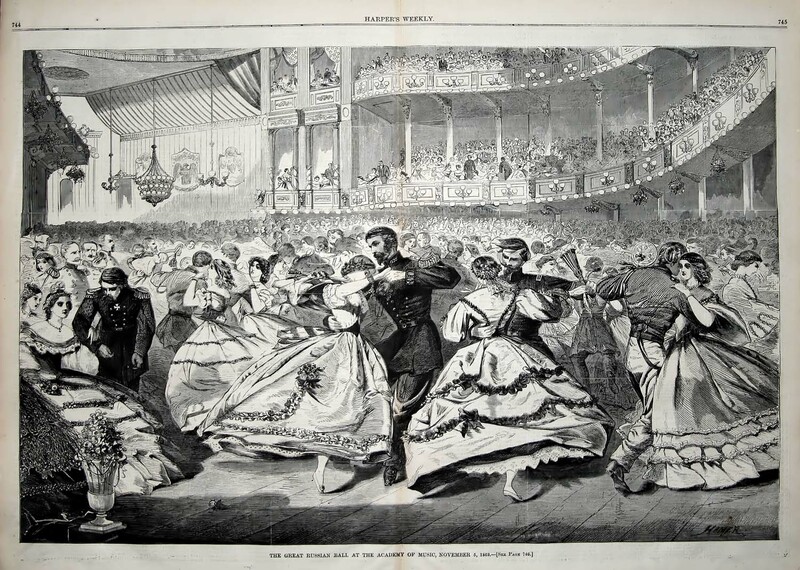 Should this number of Harper's Weekly fall into the hands of some poor wounded fellow at Chattanooga, or some half-starved Union prisoner at Richmond, the contrast between his own condition and that of the scented and perfumed dancers who figure in the ball picture may not improve his temper. "They are fiddling while I am dying," is the remark which would not unnaturally occur to him, and it would leave a bitter taste behind. "...our Russian Ball had a political significance, and may render good aid to the Union cause." 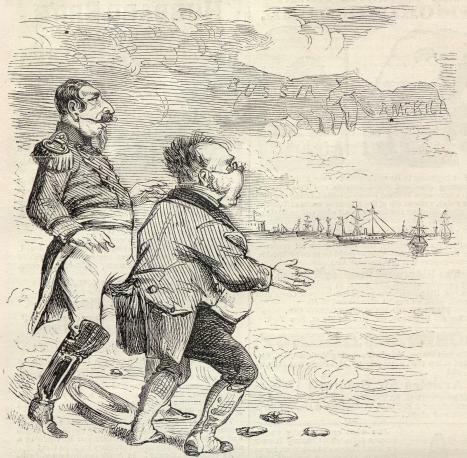 CAPTION: "JOHN BULL [England] and LOUIS NAPOLEON [France] descry upon the horizon a cloud about the size (and shape) of two Big Men's hands, and are frightened nearly out of their boots by the phenomenon." Yep, that's Europe gnashing its teeth under the spectre of US-Russian collusion. SOURCE = ibid. "TRAPPING REBEL GUERRILLAS IN THE WEST." SOURCE = ibid. 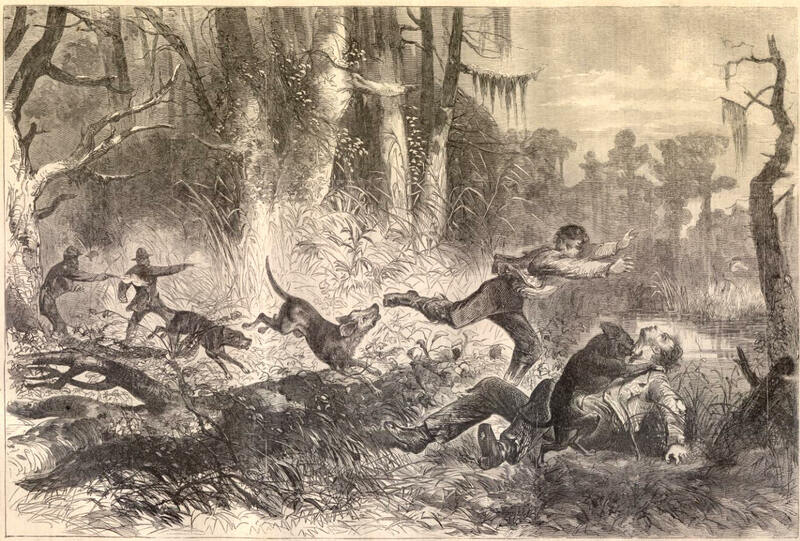 "THE WAR IN THE SOUTHWEST—GUERRILLAS HUNTING UNION MEN WITH BLOOD-HOUNDS." 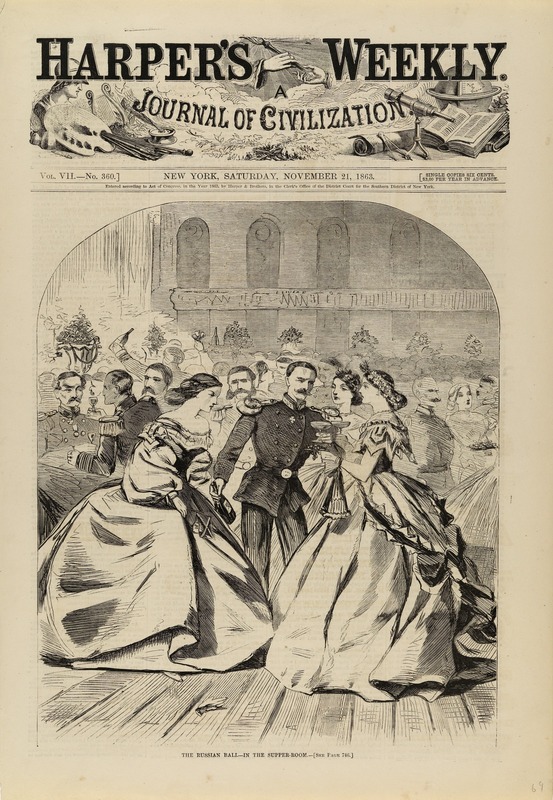 So there's some serious Civil War spectacle for you in a single issue of Harper's -- Imperial Terpsichorean twirlings b/w bloodhound fangs on patriotic throats. Go ahead, follow some of those links -- you'll see -- the rabbit hole goes on & on.